Professional liability in Illinois can arise from any number of professional relationships, including relationships with attorneys, accountants and other fiduciaries. Our Chicago professional liability attorneys represent plaintiffs in professional liability matters, including legal malpractice and accountant malpractice. Most of the concerns brought about through malpractice charges and other professional liability issues can be alleviated through the support of professional liability insurance. Like most forms of insurance, professional liability insurance allows an insurance company to assume the financial risks that an individual would otherwise have to face in exchange for reduced insurance costs. While professional liability insurance is an incredibly valuable financial tool, it is important to note that this is no panacea. There are professional threats and occupational risks that insurance cannot supplement through economic support, which require careful, responsive legal counsel. It is crucial for this reason to always seek legal representation in a timely manner during the event of any malpractice charges. Our Chicago business litigation attorneys offer legal counsel to discuss the available legal options for protecting one’s reputation and reducing individual risks for professionals, business owners or other fiduciaries alike. In many cases, professional malpractice cases pose more than just a financial risk for the involved professionals. Sometimes malpractice claims and other similar claims can threaten one’s professional reputation through occupational consequences, such as the revoking of a medical license or disbarment. Insurance rates and coverage may also be affected by such claims. Our lawyers understand that this can be a sensitive and time-urgent matter. We offer seasoned legal counsel to any professionals or representatives who may be experiencing professional liability related issues. Legal malpractice occurs when a lawyer fails to use the degree of skill and care expected in the legal profession or otherwise breaches fiduciary duties to a client. The consequences to the plaintiff client, whether it be an individual or a business, can be financially devastating. Legal malpractice cases are among the most challenging types of cases because this type of litigation can be both costly and time consuming. To prove legal malpractice and to ultimately prevail in a legal malpractice case, a plaintiff must prove the “case within a case.” In other words, a plaintiff must prove not only that the lawyer was negligent, but also “but for” that negligence, the plaintiff would have prevailed or had a better result in the underlying matter as well, whether it be a litigation, transactional, or other legal matter. Legal negligence and malpractice claims threaten the attorney’s financial wellbeing as well as the attorney’s reputation. Not only that, but legal malpractice can also lead to occupational consequences as well, such as the suspension or even revocation (disbarment) of a law license. Most attorneys carry legal malpractice insurance to cover the cost to defend legal malpractice cases and/or to help to compensate a client for the lawyer’s negligence. In Illinois, lawyers, physicians, accountants and other professional must comply with the Rules of Professional Conduct. Although violations of these rules are not necessarily proof of legal negligence or malpractice or of a cause of action, the Rules are often relevant and can be used as guidelines and to establish the lawyer’s particular duties to the client. Among the many Rules, are the professional’s duty to be honest and truthful, as well as the professional’s duty of care, competence, and confidentiality. Our Chicago litigation attorneys understand that professional malpractice cases can be sensitive and time-urgent matters. In fact, in Illinois, clients who have been wronged by their lawyer, physician or other professional and would like to pursue a lawsuit generally have 2 years to do so. This is referred to as the “statute of limitations.” If you do not file your claim within this two-year timeframe, you could lose the ability to do so. If you feel you have been wronged by your professional or that the professional your company engaged was negligent in his or her representation, call us to consult with one of our lawyers regarding your potential legal malpractice case. We offer seasoned legal counsel to individuals and professionals who may have been damaged by a professional’s malpractice. Our Chicago professional liability attorneys handle cases in state and federal courts throughout Illinois, including Cook, DuPage, Kane and Will Counties. 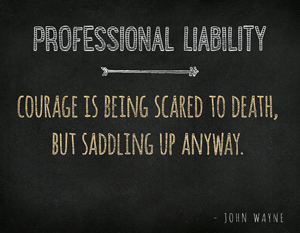 For additional information about our professional liability practice, please contact our law firm – 312-789-5676.